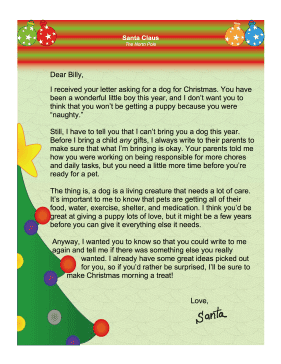 Santa can provide a thorough, thoughtful explanation for why a child can't receive a certain gift with this Christmas letter. I received your letter asking for a dog for Christmas. You have been a wonderful little boy this year, and I don't want you to think that you won't be getting a puppy because you were "naughty." Still, I have to tell you that I can't bring you a dog this year. Before I bring a child any gifts, I always write to their parents to make sure that what I'm bringing is okay. Your parents told me how you were working on being responsible for more chores and daily tasks, but you need a little more time before you're ready for a pet. The thing is, a dog is a living creature that needs a lot of care. It's important to me to know that pets are getting all of their food, water, exercise, shelter, and medication. I think you'd be great at giving a puppy lots of love, but it might be a few years before you can give it everything else it needs. Anyway, I wanted you to know so that you could write to me again and tell me if there was something else you really wanted. I already have some great ideas picked out for you, so if you'd rather be surprised, I'll be sure to make Christmas morning a treat!